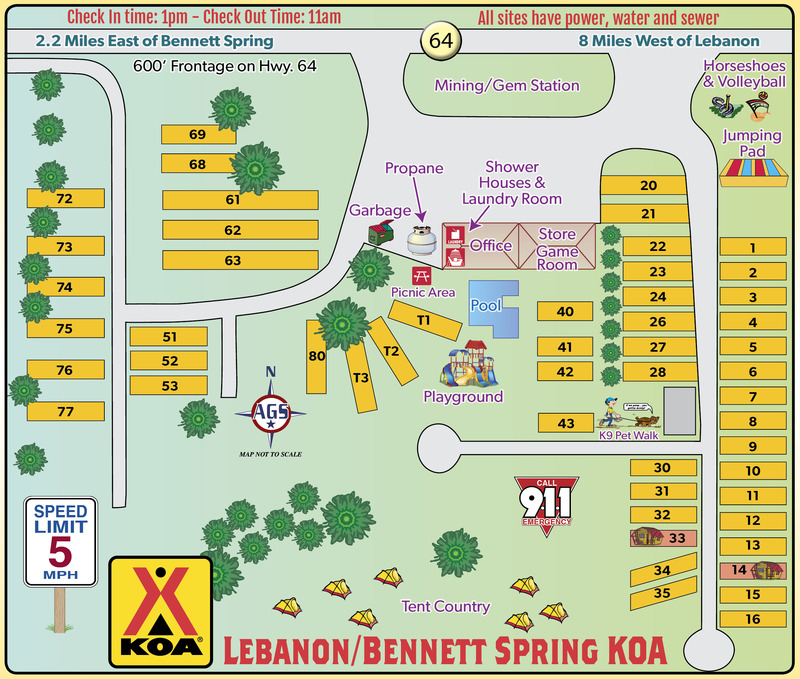 Ask fellow campers about "Lebanon / Bennett Spring KOA" and nearby attractions. I can't believe this park is part of a national franchise. Very poor condition. Needs about 20 trains of gravel/stone to bring it up to minimal standards. Abandoned/uninhabitable mobile homes on site. Numerous holes covered with old pallets. Manager was very nice at least. Much better opportunity down the road. We camped at Lebanon / Bennett Spring KOA in a Motorhome. If it had not been for the staff and clean shower house this place would have been rated much lower. We have a dilapidated trailer just feet away. I expect it to be mice house. Electric wires coming out of ground everywhere just taped. Water smells horrid. Our site had old water pipes on ground, cigarette butts. Getting out of here may be a trick.... sharp turn and huge drop off. Needs to be repositioned for out. Also open sewer drain from old trailer right in spot. We camped at Lebanon / Bennett Spring KOA in a Fifth Wheel. This is listed in the KOA book as a new park. 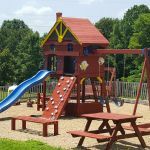 While it may be new to KOA, it is a very old park and needs lots of work to get up to scratch. The roads and sites are gravel, but many are grassed over and hard to see. The office was closed when we arrived at 1pm and we got no response from the telephone number taped to the door. We waited about 20 minutes until someone showed up and we were given our site and got set up, only to have to move after the electric power was severed during sewer repair at an adjacent site. We were relocated to a supposed pull through site right by the road with lots of traffic noise and could only get out by backing up because a bounce pad was directly in front of the site. The bath house has been recently renovated, was very clean and a pleasant surprise. Our reservation was only for 1 night; had it been for any longer, we would have moved on. 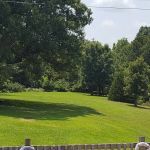 We camped at Lebanon / Bennett Spring KOA in a Travel Trailer. First Impression: Long drive north of town. Old campground being upgraded to KOA standards. Roadside décor waiting for its face lift. Safety: no concerns. Access: I-44, exit 129, north through Lebanon on MO-64 8.8 miles, huge signs on left. Garmin GPS database not up-to-date, use address. Office: Friendly staff, token store with snacks, soft drinks, a few RV equipment items. Credit cards accepted. Online reservations available. 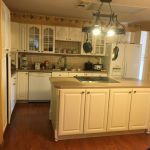 KOA discount only. Facilities: Nice pool. No spa or fitness room but nice lounge and game room. Small, clean laundry room. Clean and very modern restrooms/showers (score "A"). Propane available. Small playground. Off-leash, fenced dog run. Campground: Not in a flood plain. Lightly wooded. Interior roads are gravel with "okay" turns and no overhead obstacles. Okay for big rigs and large coaches. No tent area, yurts, or cabins. Sites are nearby but not slide-to-slide, gravel, pull-through, grass landscaping, sufficiently level. Utilities at rear of site with full hookups-20/30/50; no meters. Adequate water pressure with good taste. Sewer pipe is 4" threaded, just below ground level but I needed two stinky tubes and water hoses to reach. No patios. Most picnic tables need replaced (seriously). Fires in rings only; wood sold in store. Good satellite views despite the trees. No cable TV. Free Wi-Fi at office hot-spot only. Verizon phone and 4G at 2 bars. No recycle bins. Noise: No railroad, aircraft, traffic, or interstate noise. Bug Report (mid July): very tiny, red, micro ants, invaded the rig up the water hose. Runners: campground roads not good for running. Yoga: Put your mat on the grass if so inclined. Conclusion: Score 6-Nice. Over-priced. Too far away from the freeway for just an overnight. We camped at Lebanon / Bennett Spring KOA in a Fifth Wheel. Lebanon, MO is a sprawling town (3 exits off the interstate). Two national restaurants (Applebees, Denny's). Numerous fast food chains (McD's, Taco Bell, Sonic, etc). Handful of local restaurants. Automobile stores (O'Reillys, Autozone), local grocery stores. Diesel at Kum&Go at $2.129. Wal-mart and Lowe's east of I-44 on Jefferson (a.k.a. MO-64). Stopped here on our way from Clinton MO to Tulsa OK. Only a few sites are available as most of the other sites seem to be full-time or seasonal. Check-in person was friendly. Would probably look for something closer to I-44 if in this area again. We camped at Lebanon / Bennett Spring KOA in a Fifth Wheel. Store in front is nicely stocked, close to Bennett Spring State Park, beautiful pool, clean facilities. LP Gas and Firewood (ice too) sold at campground also. Less than 10 minutes outside of Lebanon, off I-44, and about 5 minutes from Bennett Spring State Park. Owners are very friendly and helpful. Sites are gravel with electric, water, and sewer hookups. We did have to use leveling blocks, but nothing major. There is a large tent camping area in the rear of the campground. Shower house is clean - laundry room available too. There are a lot of RV campgrounds around the area - this one is one of the best. We camped at Lebanon / Bennett Spring KOA in a Travel Trailer. 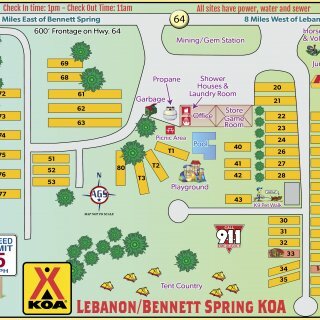 Are you affiliated with Lebanon / Bennett Spring KOA ?